Millions of women struggle every day with problems like low energy, unexplained weight gain, and dull moods, yet too often diet, exercise, and pharmaceutical drugs are thought to be the only available options. Hormones—the chemical messengers of the body—influence every single process in our bodies: they govern our growth, weight, and energy, as well as fight stress and anxiety, relieve depression, and maintain personal drive. Based on Dr. Kristy Vermeulen’s popular six-week online course, Happy Hormones explains how hormones affect your day-to-day routine and provides expert guidance to help you identify your hormonal imbalances and treat them in a natural, healthy way. 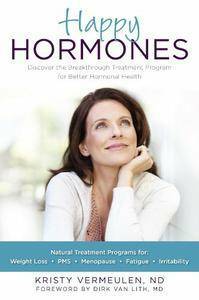 Happy Hormones is a comprehensive, practical guide for any woman interested in balancing their hormones. It will help you get back to your energetic, vibrant, and healthy self. Representing an important application of a fast-growing branch of health science, Happy Hormones will allow you to shed unwanted weight and regain your energy for a healthy, fabulous life.